Based on three years of detailed anthropological observation, this account of undergraduate culture portrays students' academic relations to faculty and administration as one of subjection. With rare intervals in crisis moments, student life has always been dominated by grades and grade point averages. 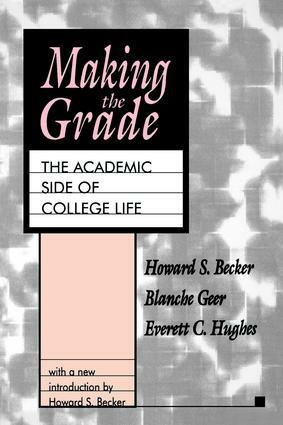 The authors of Making the Grade maintain that, though it has taken different forms from tune to time, the emphasis on grades has persisted in academic life. From this premise they argue that the social organization giving rise to this emphasis has remained remarkably stable throughout the century.Becker, Geer, and Hughes discuss various aspects of college life and examine the degree of autonomy students have over each facet of their lives. Students negotiate with authorities the conditions of campus political and organizational life - the student government, independent student organizations, and the student newspaper - and preserve substantial areas of autonomous action for themselves. Those same authorities leave them to run such aspects of their private lives as friendships and dating as they wish. But, when it comes to academic matters, students are subject to the decisions of college faculties and administrators.Becker deals with this continuing lack of autonomy in student life in his new introduction. He also examines new phenomena, such as the impact of "grade inflation" and how the world of real adult work has increasingly made professional and technical expertise, in addition to high grades, the necessary condition for success. Making the Grade continues to be an unparalleled contribution to the studies of academics, students, and college life. It will be of interest to university administrators, professors, students, and sociologists.